A pineapple slushie is cooling and refreshing on a hot summer day. And if you mix it with a juicy tropical IPA it transforms into a craft beer cocktail and gets even better. Lat summer when I was focused on IPA mango slushies I also made several with pineapple. It is hard to say which one reigns supreme among tropical slushies. I guess you’ll need to try one of each and decide for yourself. A slushie made with fresh fruit is a treat in its own right, but when mixed with very aromatic IPA it crosses over into a higher category. 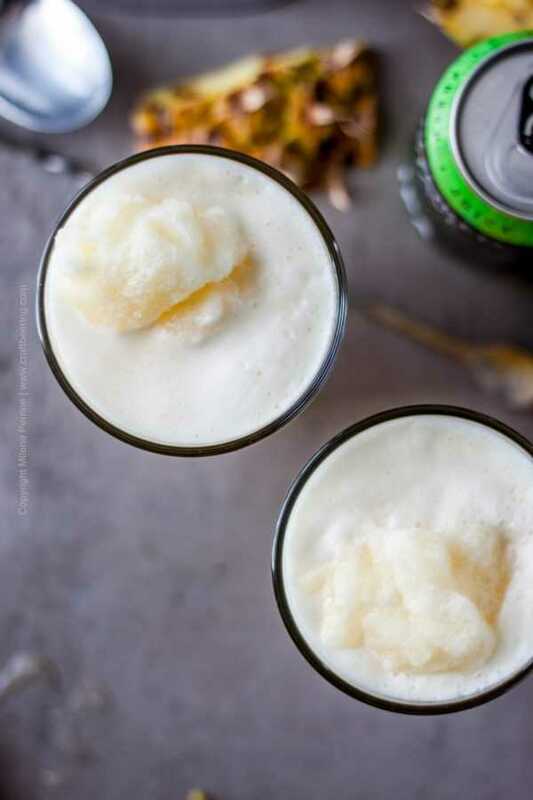 The added bright effervescence and the hoppy aromas from the ale eagerly infuse the frozen drink to create something that really is one of kind. You have got to experience a pineapple slushie with IPA at least once. It is so much fun to play with IPAs with different profiles – from unmistakably tropical fruit oriented ones to really resiny, dank and piney-mooded representatives. One thing I have noticed is that a small doze of added acidity is always helpful when making a frozen pineapple treat, whether a sorbet, a popsicle or a slushie. Typically, I’d add a squeeze of lime juice. I did once use a dry-hopped sour ale with a tropical profile in a pineapple slushie and it tasted divine. But it was an expensive beer (we had gotten a crowler from a local brewery) and so exquisitely crafted, so strongly standing on its own that I felt bad to be using in a cocktail. So IPA and a squeeze of lime juice is the way to go. 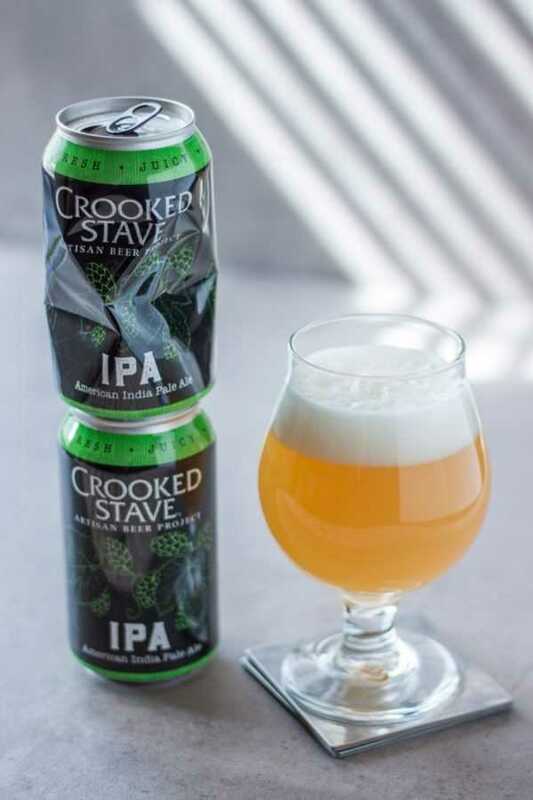 I made the pineapple slushie for this post with Crooked Stave IPA – unfiltered, hazy ale with Amarillo, Azacca, Mosaic, and Motueka hops. Amazingly nose and flavor both display the exact same confident citrus (dominant seems to be tangerine). Juicy, but finishes dry and overall closer to a pale ale. ABV 6% and instantly befriends the fresh pineapple. You can go one of two routes. You can either freeze fresh cut pineapple chunks and add them to the blender or you can blend fresh pineapple chunks with ice cubes. The frozen chunks method results in a sweeter slush due to the absence of ice dilution. This is not an overly sweet slushie to begin with and once you add IPA it becomes even less so. You can vary the amount of IPA depending on your preference. You can also consider adding a sweetening agent such as agave syrup when blending the pineapple (either approach). The lime juice introduces pleasant citrus acidity and brightens the flavor profile. I don’t recommend that you add the IPA into the blender along with the rest of the ingredients. Even if you are using OJ or another juice in lieu of IPA, blend without it and add it separately. However if using frozen pineapple chunks add a bit of water so that they can get moving and blend nicely. This is the sequence of steps I find to lead to the best results. 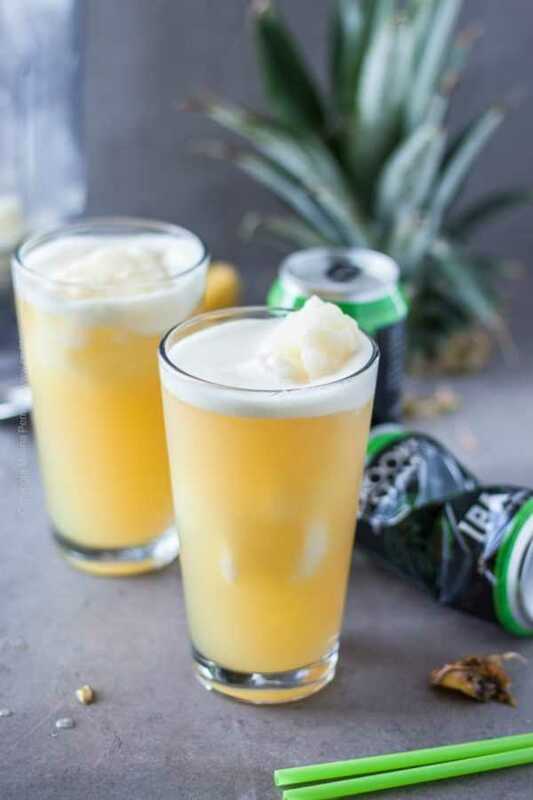 Pour the beer first and let the foam dissipate while you blend the pineapple slush. Be sure that your ale is cold. How much IPA you fill your glass with is absolutely up to you. Taste your beer first, think about how thirsty you are and how fast you are likely to pound your slushie and consider how much of an IPA presence you want to notice. If you want less IPA than called for in the recipe card by all means alter the proportions. This trial and error process is the really fun part of figuring out the optimal ingredient proportions that work best for your taste. The same applies to a situation where you are using OJ or another juice in lieu of IPA – our son loves pineapple slushies but is not even eight years old. 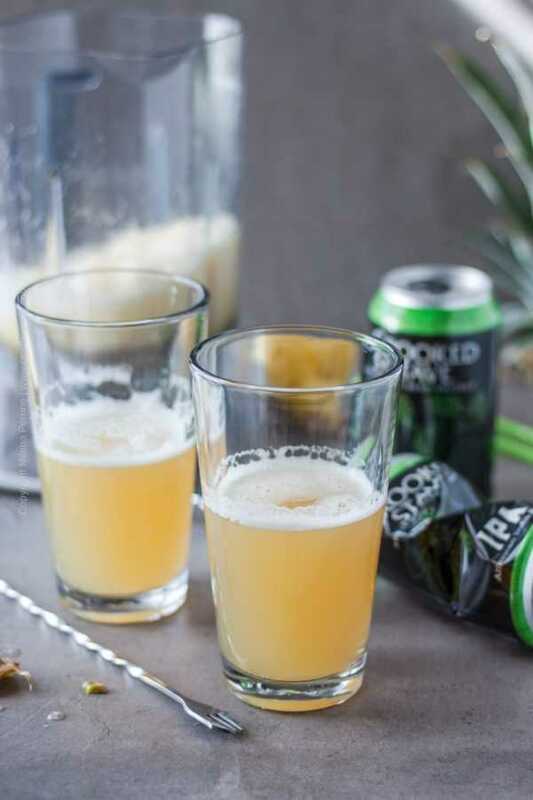 Prepare the pineapple slush and carefully ease some of it into the glass with IPA right from the blender. Wait for a few seconds for newly formed foam to dissipate and add more to fill you glass completely. Next, gently stir with a cocktail stirrer until a smooth consistency results. You will need a straw to drink it with. 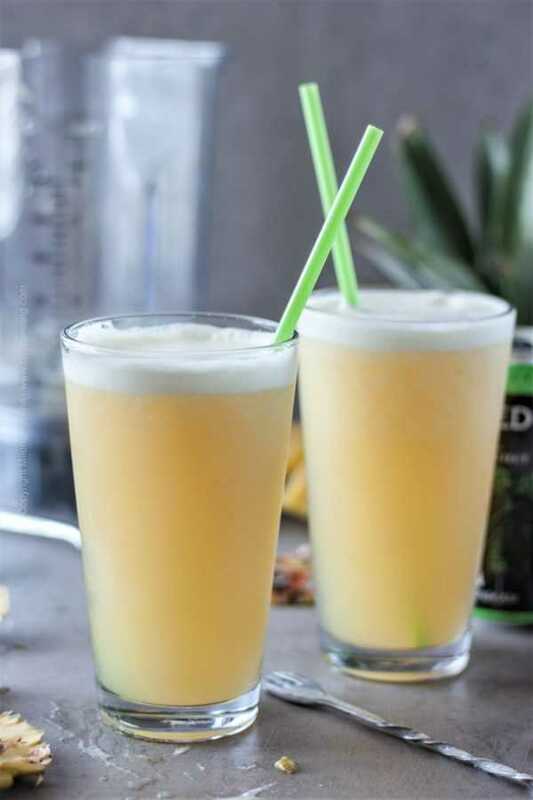 If you don’t have fresh pineapple around but you have pineapple juice you can still create a pineapple slushie pretty quickly. One less step for you and despite the loss of fresh fruit magic it will still taste good. 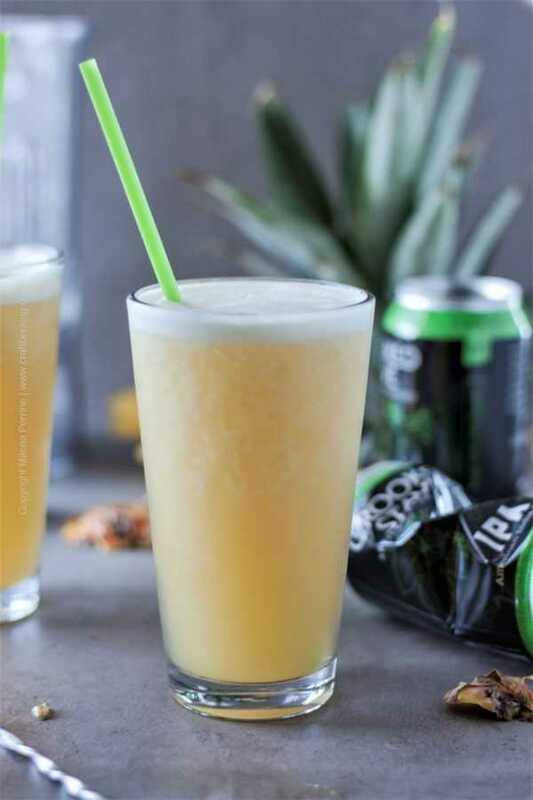 Depending on how sweet you want your pineapple slushie to taste, blend one to two 6 oz cans of pineapple juice from concentrate with ice cubes and a squeeze of lime juice and proceed with adding the mixture to the IPA or non-alcoholic beverage of your choice. 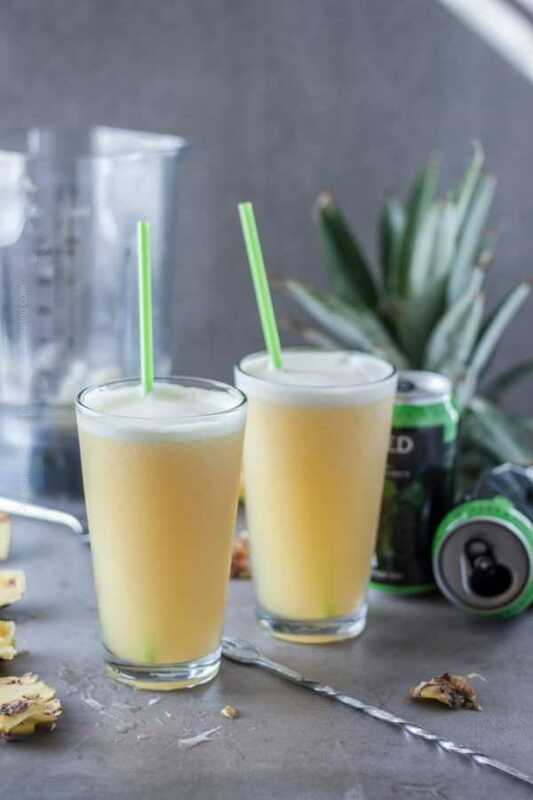 All the fresh flavors of pineapple and hops folded into a delightful and refreshing frozen drink. Peel, core and cut a fresh pineapple into chunks. Freeze the chunks to blend later with a bit of water. Alternatively prepare to use the fresh chunks along with ice cubes. Pour IPA (or juice) dividing it into two (or more, depending in your taste preference) glasses. Wait for the foam to dissipate. Add the frozen pineapple chunks plus a bit of water or fresh chunks and ice cubes to a blender. Add agave nectar (optional) and lime juice (recommended). Blend until no large solid chunks of fruit remain. Carefully top the glasses with IPA with pineapple slush mixture. Stir until well mixed. Enjoy immediately. This recipe intrigues me. Pineapple and beer? I need to give it a try. Thanks for sharing at the What’s for Dinner party – have a great week! Good gravy this drink looks incredible! I mean, you seriously had me at IPA. I doubt I would have any IPA left FOR the slushie if that beer was in my house!! I would probably snack on the pineapple and drink beer at the same time and call it a day. HA! Just kidding. I’ve got to try this, it looks amazing! 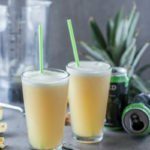 Your method is almost the same:) You will like an IPA pineapple slushie, I am sooo sure! Mmmmmm how fun is this drink recipe?!! And I totally love your idea of freezing pineapple cubes! That is genius!! Guys, this looks divine! I am so thirsty for being outside in the backyard that I would gulp it down without breathing 🙂 . That ‘misty’ look is so mysterious, the foam and pineapple slush on top so inviting! Pinned! Probably not a good idea for breakfast, huh? No – not a good idea. Is it? 😉 Pinned and shared and all the things! YUM! Right on, it is perfect for breakfast so long as you are planning on lounging all morning:) A great weekend treat! This is definitely doing summer right! At 6:20 this morning, it was already 76 degrees outside so I’m thinking by lunchtime I’ll be ready for something frozen. This looks perfect! Now this looks like a proper summer thirst quencher. Though, I must admit, it’s not like summer around here yet. Can you believe that I woke up to snow on the ground this morning?! Oh my! I guess I’ll have to stay inside, close the blinds, make this delicious drink and pretend that it’s summer, lol. Cheers friends! It really does quench thirst:) We are having nineties daily this week, similar story last week. Hope your summer weather catches up and hope we get some rain soon! Have a wonderful week!